For over 30 years, our dedication to quality and value has earned us a reputation for excellent standards. It has also brought us recognition from some of the most prestigious manufacturers; including Porsche, Jaguar, Lexus and Mazda. We were also Mercedes Benz approved for many years up until February 2012. We are looking to a successful future which is why we invest in people as well as equipment. The dedication of our specialised staff has played a major part in our success. Many leading insurers also rely on us for professionalism and efficiency; the best possible endorsement of our high standards. We are so confident of our high standards that all work is guaranteed. After a wash and vacuum we keep your "good as new" car securely until you collect. 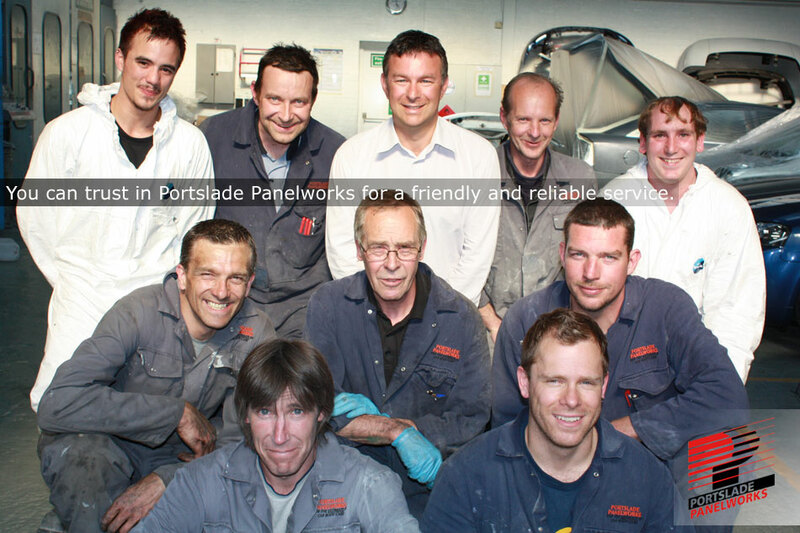 The next time you are unfortunate enough to have an accident, call Portslade Panelworks. If you haven't already read what our customers have said about us, we think you ought to. Paul Chambers (top-centre) with some of the team.